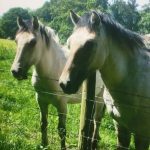 A pure bred Highland mare joined our herd of lovely ponies in July 2107. By vote, her name is “Ellie”, which is what she was called originally, by her breeder. 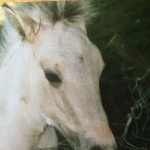 She is a Yellow Dun – over the years her colour has faded, so she just has yellow spots in her coat now, but you will see she was quite yellow as a foal. Ellie is more “pony-ish” than most Highlands. 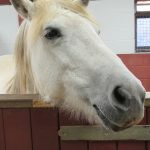 She was born 2005 (June) and her Mother was Claymore Mairi (Claymore stud is from the Western Isles and they are more “ponyish” than the mainland “Garrons”). 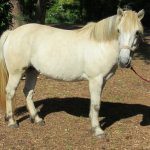 Ellie had 3 foals whilst with her breeder and was professionally broken to ride.